Dr. Leonard Peikoff, Ayn Rand's intellectual heir, once asserted that in the continuum between freedom and tyranny the United States was over the halfway mark towards the latter – ostensibly in large part due to an activist federal government that moved beyond its constitutional mandate. While most would brush away the comment as an extremist point of view, it has often prompted others to wonder how far away the United States has moved from the original design the Founding Fathers has for it. We know what they thought on the topics of their day, but how could we possibly divine what they would have thought about environmentalism, health care or TARP? Judging by Dr. Larry Schweikart's What Would the Founders Say? 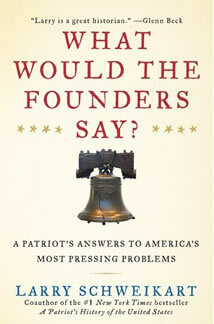 A Patriot's Answers to America's Most Pressing Problems, the more things change, the more they stay the same. The University of Dayton historian's latest work parses the Founder's words and deeds and finds that many of the issues Americans are grappling with today were addressed in one form or another over two centuries ago. Bank bailouts, land use or debt and deficits? The nation was barely out of her teens before the revolutionary generation and its successors were navigating through these very waters. Schweikart poses ten policy questions that have late been debated including whether the government has the responsibility to protect the environment, whether anyone has the right to regulate firearms, campaigns to improve health, management of the economy and the purpose of war, among others. Utilizing primary sources, Schweikart argues that the Founders largely stayed out of issues that the constitution held were not in the mandate of the federal government. Although they occasionally strayed outside of its bounds, something forgotten by many of their admirers, they generally resisted pressure to act even if the consequences would cause a great many people harm, including themselves. A perfect example are bank bailouts. Proving that there are very few things under the sun, at least in politics, in 1792 a wave of speculation threatened several banks thanks to the actions of a New York business man named William Duer. Modern times saw the Bush and Obama administrations immediately agree to provide the banking sector and concerns run by men like Duer with money on the grounds that they were "too big to fail." In 1792, Alexander Hamilton, a man Schweikart argues doesn't deserve the bête noire reputation he has amongst conservatives, allowed Duer to fail and only privately assured the Bank of New York – and unknown to the public – that he would not allow it to collapse through loans at a penalty rate. Outside of some flexibility to those who owed money to the government, Hamilton largely avoided any issues of moral hazard and his touch on the economy was light. On the issue of gun control, as another example, Schweikart shows through contemporary state legislation and political writings that it was simply assumed the common person owned firearms. In fact, it was mandated by law in several states that a person had to own a firearm, not as part of an organized government militia, but as a private citizen. It would have been inconceivable to the Founders that the federal government would one day argue that the constitution allowed it to regulate ownership of firearms when the guarantee of the Second Amendment was put in place to protect the citizenry from their government. In issue after issue Schweikart magnificently illustrates that the Founding Fathers didn't create a nanny state that was expected to provide womb to tomb protection, outside of protecting the rights of Americans from external and internal threats, but rather to provide the opportunity for life, liberty and the pursuit of happiness. The months and countless hours of debate over the precise wording of the constitution produced a document that carefully weighed what powers the federal government needed to ensure the survival of the new nation, but also to minimize its footprint amongst the lives of Americans themselves. The answer to the question that is the title of Schweikart's is likely calls for a second American revolution. A cynic could rightfully point out that the ink was barely dry on America's constitution before the nation's politicians, including the sainted Founding Fathers, did what they could to circumvent it. Thomas Jefferson, beloved for his small government constitutionalism, blatantly and knowingly ignored the constitution while executing what eventually became known as the Louisiana Purchase. His reasoning, one that should be familiar to Americans today? National security. In fact, if Schweikart's effort proves anything, most of the sins against the constitution have been justified on those very grounds. George Washington probably would have railed against the USA PATRIOT Act while a colonist and proposed the same legislation as president. Although not the intention, What Would the Founders Say? does illustrate how difficult it is to balance fealty to the constitution with the realities on the ground. It was easy for then congressman Davey Crockett to argue in the early 1800s that Congress wasn't in the business of charity and be applauded for it. In 2005 George W. Bush was dealt a nearly fatal blow for a perceived weak response to Hurricane Katrina. Even the Founders occasionally stepped outside of the limits of the constitution that they themselves wrote. This is not to argue that any breach of the constitution is permissible, merely that it seems like any law, it appears to have been made to be transgressed. That, of course, was not Schweikart's goal and nor does What Would the Founders Say? cast a knowing wink to those who would consider constitutional mandates to be malleable. Rather, Schweikart set out to prove that the Founding Fathers would have very likely would have approached our pressing issues from the perspective of limited government, allowing the people to solve America's problems in a manner that would have suited them best. Unfortunately, outside of a few conservative historians, a handful of congressman and the relatively few Americans who helped found the modern Tea Party movement, those wise voices from the past have largely been ignored.